Alex Polednik, a UT Dallas sophomore, has volunteered for the past year, mentoring students from 3rd to 9th grades. Although technology has become a huge part of who I am today, growing up in Colorado has certainly had the biggest impact on how I like to spend my free time. I absolutely love being outdoors whenever possible to hike, camp, or fish without the distractions of a cell phone or computer. Ever since I can remember, I have always been passionate about technology. For my entire life, my dad has worked as a computer engineer and would occasionally bring me in to work as a kid to show me what he was working on at the time. These experiences helped plant the seeds for my love of programming and hardware. By the time I got into high school, I was extremely interested in smartphones, and it was this passion that led me to begin programming in an attempt to create a game for my phone. More recently though, I keep myself up to date on new technologies that come out each year and have directed my interests toward the wearables industry. What do you study in college? I am currently a Sophomore at the University of Texas at Dallas studying Computer Engineering. While I am not currently working on a project, I interned for Hawaiian Macadamia Nut Orchards this past summer as a Software Engineer. During this internship, I developed multiple applications to improve the efficiency of the orchard managers and harvesters including a personalized mass-messaging system in addition to an application for harvesters to digitally submit orchard information. The data gathered from this application is now being used to more effectively analyze the overall health and production of the orchards through machine learning algorithms. 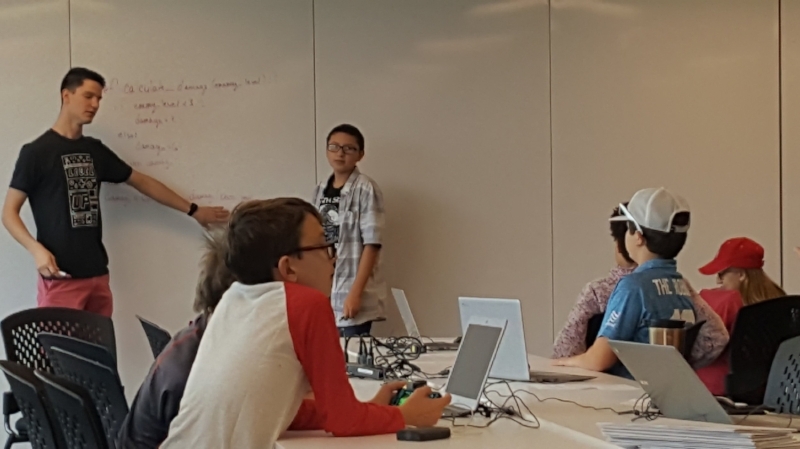 Through my work with the Bold Idea organization, I have learned how to better express complex ideas to students with no background in computer science. While one explanation might make the most sense to me, I often have to come up with two to three different explanations that hopefully relate to something the students have learned or experienced in the past that they can apply to a computer science problem. It has challenged me to think outside the box and better understand some concepts for myself. My most memorable moment as a mentor occurred during my first semester with the organization. I was working with a pair of students in the Creative Computing group to come up with a final project idea. I had each of them write on the white board what they wanted the program to include, and then we worked to combine the ideas together. In the end, their faces lit up with joy when they decided on Unicorn Taco Soccer. I love seeing the creativity and excitement when the students get to see their idea go from concept to working project! The one thing I would tell my younger self about coding is to never copy and paste code that I didn’t understand. My first programming experience was in my freshman year of high school when I wanted to create my own android game. Instead of truly understanding the code, I copied and pasted tutorials, which led me to become frustrated and give up when I didn’t know how to translate that code into my own application. It wasn’t until over a year later that I got back into programming and began to take the time to understand what the code meant. I firmly believe that all students should be introduced to computer science and given the chance to succeed. Through the Bold Idea program, I love seeing the students learn a new skill while having fun by expressing their own creativity with their peers. This aspect of the organization gets the students excited about programming and will hopefully lead many to pursue computer science as their career or even just a hobby.